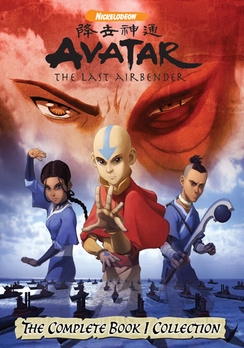 Though it’s easily the weakest season (or “book”) of the show’s three, the excellent first season of the Avatar: The Last Airbender is firmly in the category of superior children-oriented entertainment that’s deep and exciting enough to be appealing to all viewers. The show’s opening sequence explains that the world of Avatar — an alternate version of Earth — was for centuries in balance between four nations. Each nation is named after one of the four elements: earth, air, fire, and water. A small percentage of people born to each nation are blessed with the ability to “bend”– spiritually manipulate through a hybrid of martial arts and magic — their element. A hero known as the Avatar is the one person in the world who has the potential to bend all elements, and also enter something called the “Avatar state” which is a heightened power combining all four elements. 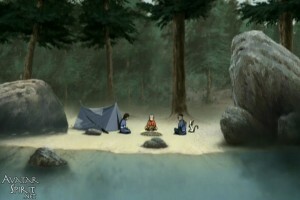 It’s the Avatar’s role in the world to maintain balance and peace of the four nations. When one Avatar dies, he or she is reincarnated. Avatar: The Last Airbender begins its story a hundred years after the Avatar has vanished. The Fire Nation has taken over, hunting the Air Nomads to extinction and the Water Tribe to near-extinction. A brother and sister of the Water Tribe, Sokka and Katara, discover a member of the Air Nomads frozen in an iceberg. 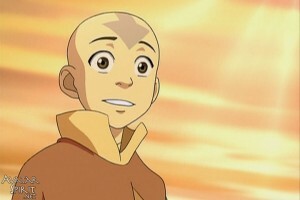 We quickly learn that this Airbender, Aang (rhymes with “bang”), is in fact the Avatar, and the time has come for him to fulfill his duties and restore peace and balance to the planet. 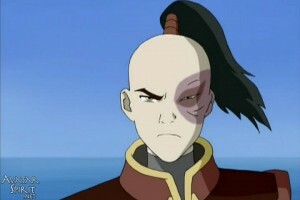 Meanwhile, a banished prince of the Fire Nation, Zuko, has been tasked with capturing the Avatar to restore his honor. 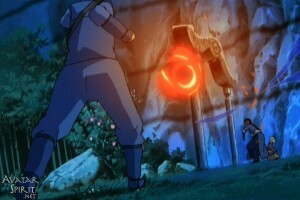 When Aang reappears, Zuko quickly begins tailing him. I’ll end my explanation of the premise there, because Avatar is rare in how quickly its plot progresses and expands. Suffice to say that The Last Airbender is a globe-spanning epic, and it shows in these twenty episodes. Like any great television story, regardless of genre or intended demographic, Avatar thrives because its characters are both well-defined and dynamic. The characters start out as basic types: We’re first shown Aang as the naive one, Katara as the optimistic one, Sokka as the comic relief, Zuko as the obsessed villain, and Iroh as the goofy wise-man. But these types serve as springboards for more complex creations. Every major character is given depth and ambiguity that is gradually revealed. Few kids’ shows dare to have a serial story. But Avatar is one long arc with several multi-episode stories and a very strong continuity that makes it tough to watch episodes out of order. This provides for a more satisfying storytelling than the usual one-and-done format for animated stories. Focusing a bit more on the serial plot and less on one-offs would have given the writers a chance to solve one of the problem the season faces in its final episodes: some serious pacing hiccups. The changes the characters go through in the Northern Water Tribe are seriously rushed. Sokka’s relationship with Yue and Katara’s training in waterbending take place entirely over just a couple of episodes when they’re really major developments worthy of longer arcs. The finale also suffers from a few plot twists that abandon the emotionally grounded reality of the show for a conclusion that’s awe-inspiring but not moving in the same way the next two season finales are. But the show-stealer, beginning with “The Storm” about halfway through the season, is Zuko. Though he’s obsessed — and whiny at first — the show slowly chips away at his shell to reveal a startling portrait of shame and pain. His journey is at the heart of the show, perhaps even moreso than the title character’s. The show brilliantly parallels Aang and Zuko in numerous episodes, and most of these are among the season’s best — particularly “The Storm,” perhaps the entire season’s highlight. Zuko has too many great moments to mention them all, but his big revelation in “The Blue Spirit” and moments of vulnerability and doubt towards the season’s conclusion are particularly unforgettable. Along with characters that work on an emotional level and a plot that works on a intellectual level, The Last Airbender‘s first season also works in a visual and visceral level. The design of the show is stunning, heavily influenced by anime and other Eastern art. You can see some of this in the plotting and the comic timing, but it’s especially apparent with the looks of the characters and settings. It’s not a cheap knockoff, though. Rather than making a watered-down Naruto and Dragon Ball Z, the makers of Avatar instead use it as inspiration. They borrow a Japanese visual style, fuse it with some other Asian influences (detectably, some Indian and Chinese motifs), and presents in a distinctly American manner. Rather than diluted, the show’s diversity takes the strengths of many of its inspirations, and presents it with a level of care and detail unheard of in a weekday afternoon programming. The best comparison I can come up with is Batman: The Animated Series. This gem from the mid ’90s had a wide variety of stylistic influences, but had a style all its own. Both shows have a maturity and darkness to them, though both still clearly fall under the umbrella of kid-oriented television. Both shows are fun to look at, but have something beneath the surface. Batman paired, visually and thematically, noir-fused shots and a palpable menace. Avatar instead pairs a natural, earthy look with a moral urgency in a decaying world. The most striking visual element of Avatar are its stunning “bending” action sequences, which are a breath of fresh air from typical fisticuffs and gadgetry of American adventure shows. The creator’s wring every conceivable situation from these supernatural abilities. Instead of having the characters stationary, calling forth magic or spells, the action is more kinetic and physical. These sequences alone make the show worth watching. Another strength, equally important to Avatar’s success as the characterization and action, is the show’s allegiance to traditional storytelling. Every episode – or at least, every excellent episode – has stakes and consequences on its own. Yet, everything feels like it’s a part of a greater whole. Watching these episodes in sequence, they successfully feel like a first act to a large narrative. Perhaps the biggest annoyance of the season and series as a whole is simply its nature as a kid-oriented show. Because it’s aimed at less experienced viewers, the lessons and themes of the show are rarely left implied. Pretty much everything is spelled out, which can come across as a bit cheesy, even contrived, at times. It doesn’t significantly diminish the quality of the show, but it could be off-putting at first to people weaned on mature, prime-time TV. There’s also a childishness to the show’s silly humor that I find endearing but might grate others. The show improved on this in the other seasons as they realized they had a wider audience than they initially anticipated. Again, it’s a quirk of the show that the childish-at-heart will probably enjoy. Overall, the first season of Avatar ranks among the best American-made animation of the past decade, even if it fails to reach the phenomenal heights of the next two seasons. It overcomes a few pacing issues towards the end of the season and a few throwaway episodes to be must-watch for anyone with a taste for animation, fantasy adventures, and kung-fu. Even those who don’t fall in that category will find plenty to love in Avatar: The Last Airbender, Book 1: Water. Pingback: What type of fabric do you recommend?